This costume was created by 12-year-old Jaden. 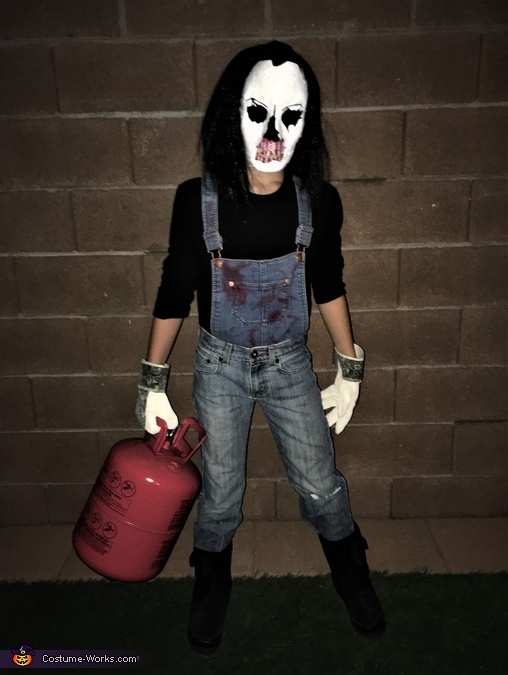 It was created with overalls, red makeup (for the blood on the chest), a strait wig, blue jeans, and boots. The mask was created with a white Halloween mask, several makeup and lipstick colors, fake teeth, wood glue, sheer black fabric, a black sharpie for the eyebrows, nail polish for the shine, White Out to the blend the individual pieces together, and white paint for the base. All the cracks in the mask were hand-cut with reference to the images from the game. This mask took around 3 months to complete. The full costume ended up being around 85 dollars.